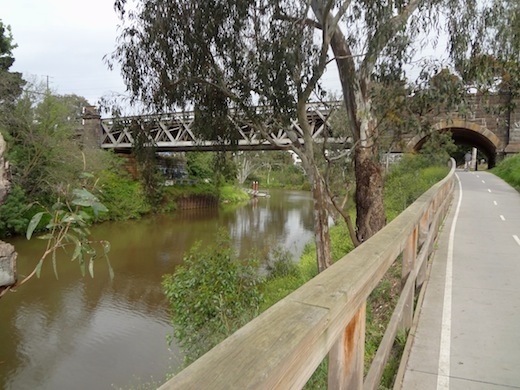 The Main Yarra Trail follows the Yarra river all the way into the city. It is a scenic bike path that is used both by commuting riders, families, and road bikers. A great way to get to the city without a traffic light or even road crossing! Most of the time it doesn't feel like inner Melbourne at all. 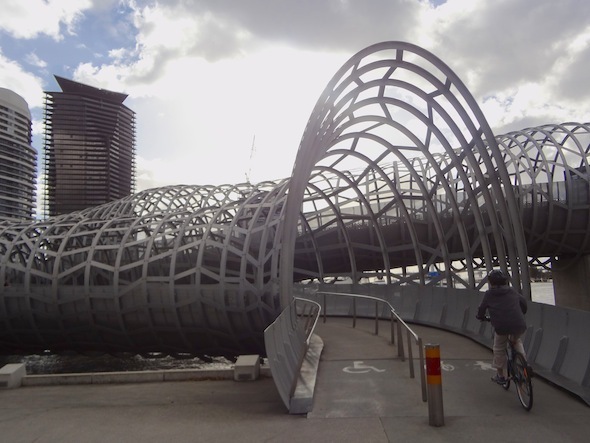 The path from Fairfield to the Federation Square is 18km of easy riding - except for a couple of flights of stairs you have to navigate in Abbotsford, as the funds to upgrade this section of the bike path have been spent elsewhere. It is not the shortest way to the city, as the Yarra trails east before curving back to the city, but it is by far the most beautiful way of getting there. 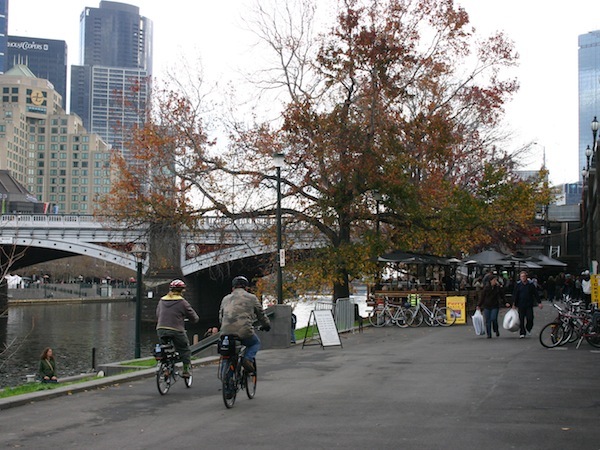 The Main Yarra Trail to from Fairfield to the CBD is part of Melbourne's Capital City Trail - the bicycle ring road around the inner Melbourne North. 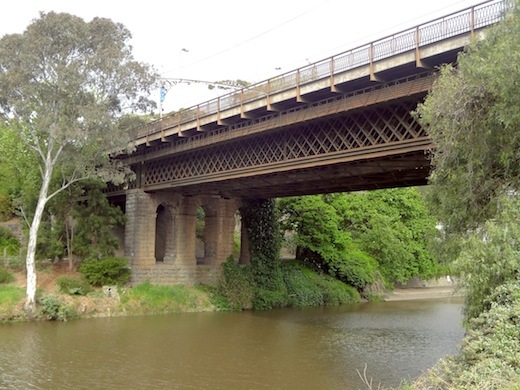 Following the Yarra northeast from there, the Main Yarra Trail continues all the way to Eltham. 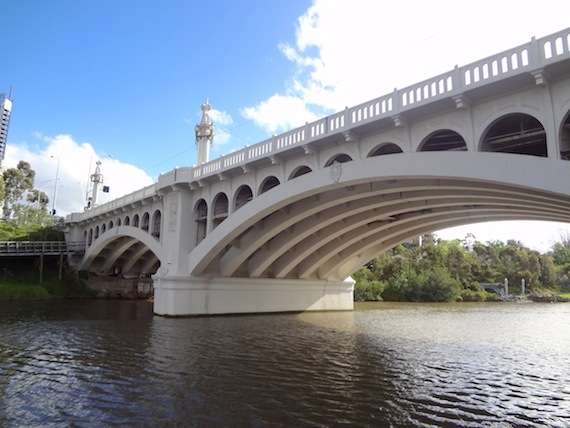 With the cherished Yarra along your side, the Main Yarra Trail passes Dights Falls, the Collingwood Childrens Farm and Abbotsford Convent, and a number of architecturally interesting bridges, before you ride into the city alongside the domes of Melbourne's iconic sports venues. 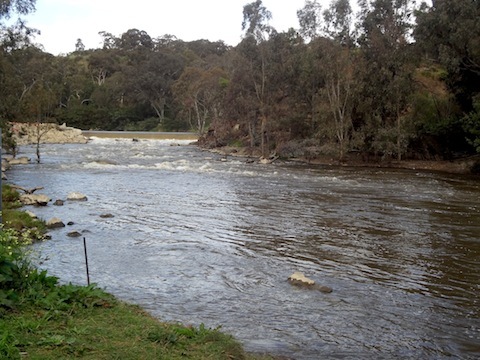 Where the Merri Creek joins the Yarra, are the Dights falls. The Yarra narrows there between volcanic rocks and a sedimentary sandstone rise on the other side. 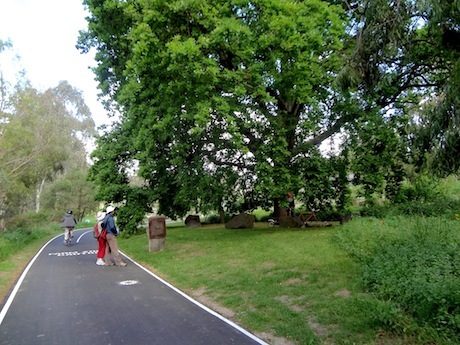 This used to be a meeting place for indigenous Wurundjeri tribes, with the rocks providing a natural river crossing and fishing spot. 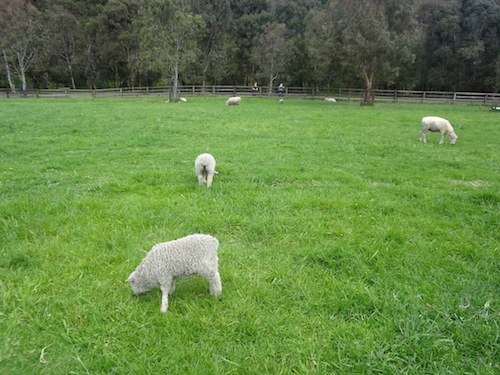 Just south of Eltham is the Diamond Valley Railway, a quirky delight for the young at heart. 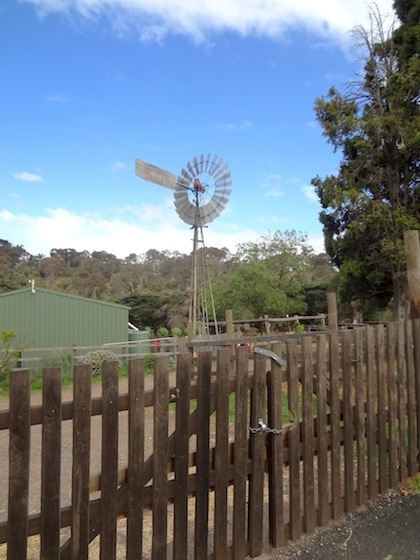 It is a fantastically laid out miniature railway with around 2km of winding tracks, tunnels, bush and a myriad puffing trains, including authentic drivers, whistles and railway crossings. Lot of love has gone into this and it's well worth a ride - not just for kids. It is cheap and operates on Sundays and holidays. With the coming of industry the river crossing was replaced by an artificial weir in the 1840s. This is currently being replaced by a new fishway that will allow fish to swim past the weir, allowing migratory fish to get to their upstream tributaries. 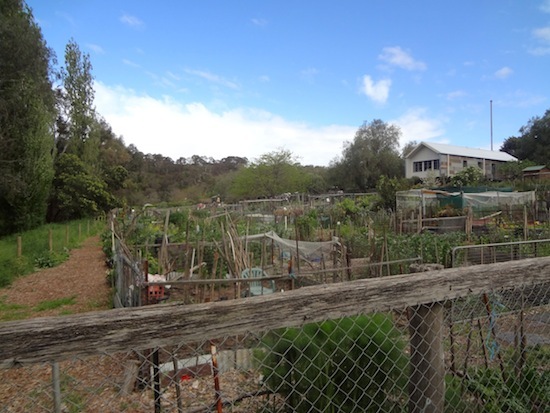 Further along the bike trail you pass a remarkable Oak tree and then get to the Collingwood Children's Farm, complete with goats, quirky garden plots, a milk shed, roaming chickens and a coffee shop for a complete urban farm experience. 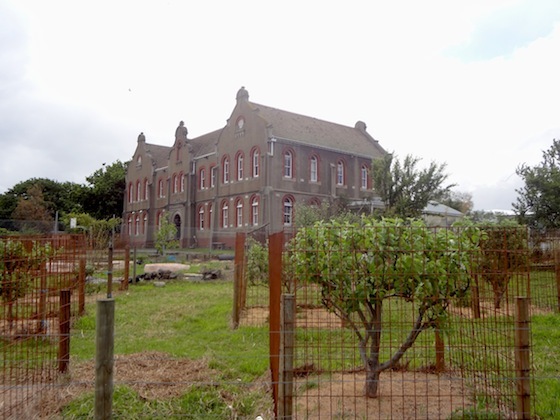 Opposite is the Abbotsford Convent, a thriving arts and community hub with markets, artist and great food. 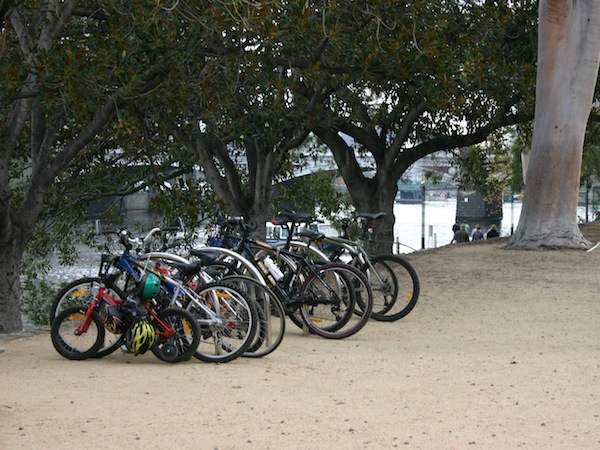 Trailing in a southeasterly direction, the bike path takes you along scenic river views and interesting bridges, before it turns west towards the city. At the MacRobertson Bridge you have the choice to cross over to the southern side of the Yarra - or continue along the northern side. You will pass Herring Island, a Yarra Island turned sculpture park that you can reach by a free punt service from Como Landing on summer Sundays. On the southern side are also the Royal Botanic Gardens. 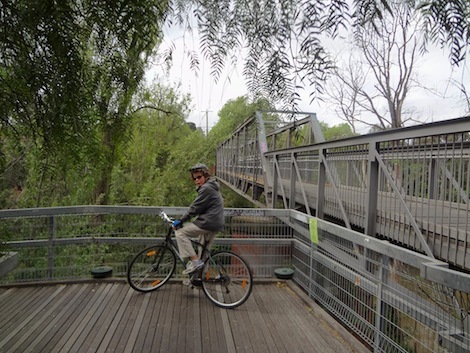 Along the northern side, you trail below for a while below the Monash Citylink on a floating pontoon bike path. 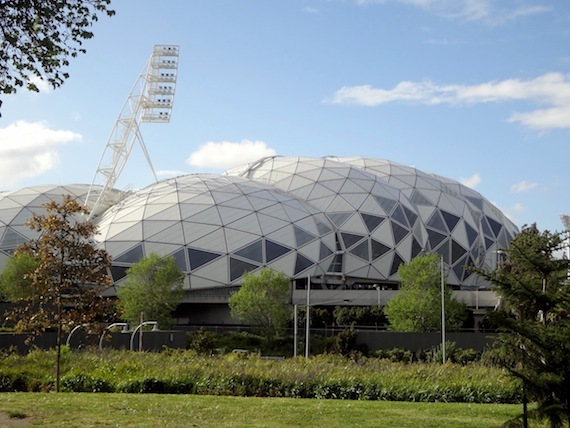 On the home-straight you pass the new Olympic Park, Rod Laver and Hisense Arenas, and the MCG. From there it is not far to Birrarung Marr and Federation Square. From there you can continue on either side of the Yarra right to the Docklands. 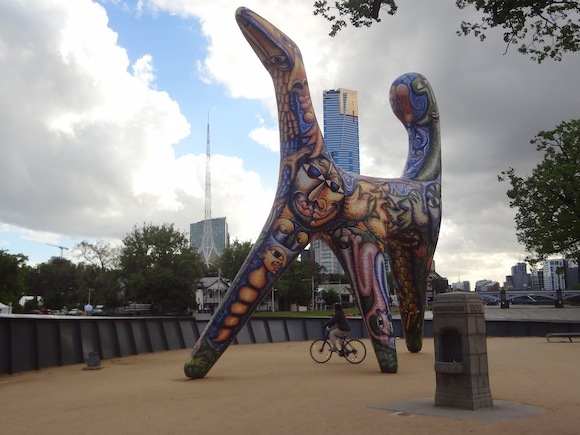 You can start the Yarra Trail at Fairfield Boathouse, continue the Main Yarra Trail from Heidelberg, or join it from the Capital City trail, coming from Royal Park, or from the Merri Creek trail. You can't really get lost - just follow the Yarra! 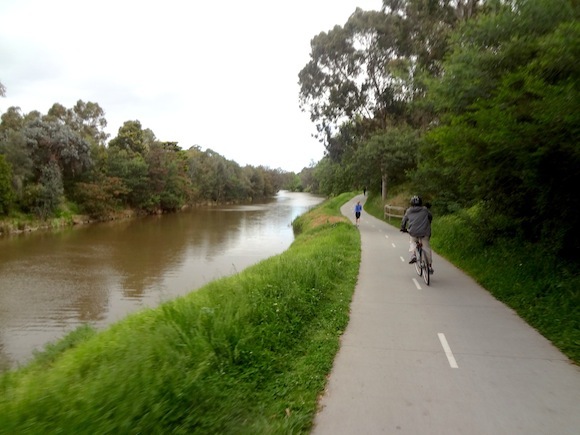 Here is a Google map of the Main Yarra Bike Trail. 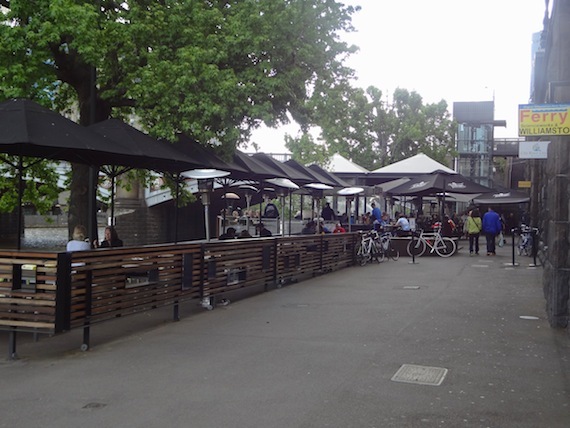 In the city, you may want to catch a train from Flinders or Spencer Street Stations, or continue the loop via the western part of the Capital City trail back to Royal Park, or ride across to Yarraville and Williamstown from the DocklandsÉ. The possibilities are endless. 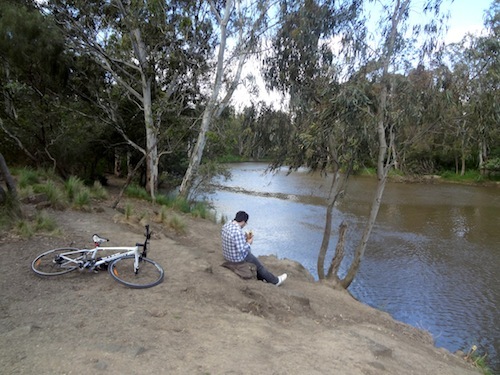 Enjoy our photo gallery of the Main Yarra bike path to the city. 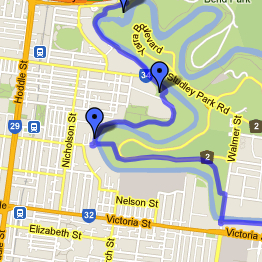 Google map of the Yarra Bike Trail from Fairfield to the Melbourne CBD.